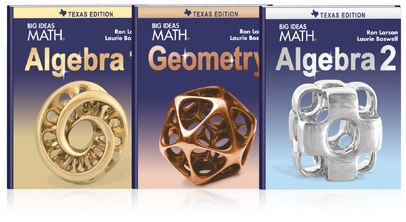 Big Ideas Learning® provides comprehensive courses for Algebra 1, Geometry, and Algebra II in its Big Ideas Math® series for Texas high schools. Courses integrate the Mathematical Process Standards throughout instruction and include support for English language learners and Response to Intervention at each tier. Instruction encourages students to think mathematically, justify their conclusions, and communicate their reasoning using precise language. Virtual samples are available here. Learning List has reviewed this series relative to the Texas Essential Knowledge and Skills (TEKS). In each course, chapters begin with two short features: (1) a review of prior learning titled “Maintaining Mathematical Proficiency” and (2) a set of exercises focused on Texas’ Mathematical Process Standards. New concepts are framed by an “Essential Question” and include a brief set of “Explorations” exercises that help students make sense of what they are learning. Online resources include a “See the Big Idea” video that connects each chapter’s content to real-life STEM issues. Each chapter has a TEKS-based practice test (Texas Essential Knowledge and Skills) and a performance task in which students apply new learning to a real-life problem. Big Ideas Learning provides a comprehensive correlation to the TEKS as well as point-of-use references to the relevant TEKS in each course’s teacher edition. Teacher resources also include point-of-use pacing guides, answer keys, and guidance in differentiating instruction, designing interventions, and supporting ELLs. Print teacher editions reference the online resources that are available to support each lesson. Big Ideas Math® is a registered trademarks of Larson Texts, Inc.